In some Audi & Volkswagen vehicles with factory installed satellite radio you cannot add an iPod or Auxiliary audio input adapter without disabling the satellite because they share the port. We have designed splitters that allow you to use both. This splitter works with the factory iPod adapter as well as any aftermarket unit. It can be installed after you have already disabled the satellite radio in your vehicle as long as you have not taken out the satellite radio tuner. This is a part we designed and manufactured ourselves. This splitter can be used but must be run to the Satellite tuner in the back left of the trunk. We recommend you see the Enfig AUDI SAT PASS 3. -This splitter can be used but must be run to the Satellite tuner in the back left of the trunk. We have been told that these cars all have the glove box CD changer connection. Please check for yourself and we would appreciate it if you let us know info@enfig.com. If your car has the CD changer connection in the glove box. We recommend you see the Enfig AUDI SAT PASS 3. -If you have the CD changer connection in the glove box (we think all 2006 had it and non of the 2007 had it. Please E-mail us if you know info@enfig.com)you do not require the splitter unless you are using the Dension GW16AC2, USA Spec PA11-VW6 or factory iPod adapter that uses the CD changer port (non text). Your car has a CD changer connection in the glove box that does not disable the satellite radio. The Blitzsafe, Grom & Dice units all make a glove box version that conects in the glove box and does not disable the satellite radio. If you retrofitted the navigation radio your car may or may not have this port. -if you have the factory iPod adapter that uses the CD changer port (non text) the conector behind the radio must be put back to stock before the Sat Pass is installed. Audi A4 2007 2008 with non navigation in Dash 6 Disc radio. -This is the correct Sat Pass. The tuner is in the back left of the trunk behind the plastic panel. Audi A4 2005.5 & 2006 with non navigation in Dash 6 Disc radio. I have seen a few of these cars with satellite radio. Audi TT 2007 2008 2009 with non navigation in Dash 6 Disc radio. 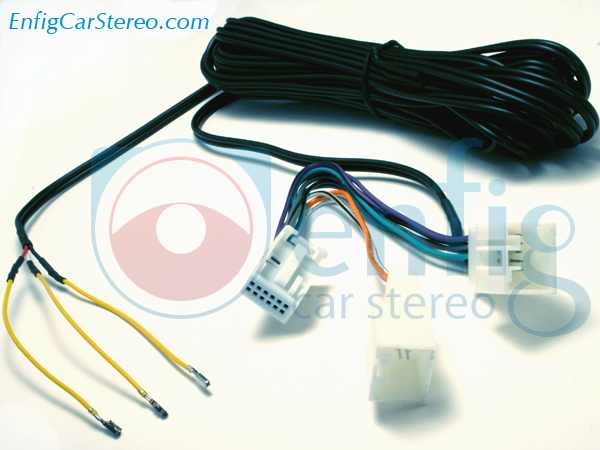 -Cars with the glove box CD changer connection do not require the splitter unless you are using the Dension GW16AC1, USA Spec PA11-VW6 or factory iPod adapter that uses the CD changer port (non text). Your car has a CD changer connection in the glove box that does not disable the satellite radio. The Blitzsafe, Grom & Dice units all have a glove box version that does not disable the satellite radio. If you retrofitted the navigation radio your car may or may not have this port. If you have the glove box CD changer connection and are using the Dension GW16AC1, USA Spec PA11-VW6 or factory iPod adapter that uses the CD changer port (non text) see the Enfig AUDI SAT PASS 3. - if you are using the Dension GW16AC1, USA Spec PA11-VW6 or factory iPod adapter that uses the CD changer port (non text) this is the correct Sat Pass..
Audi TT 2004 2005 2006 with non navigation in Dash 6 Disc radio. We think satellite radio started in 2004 for the TT. If we are wrong please let us know info@enfig.com. -This interface will work with all models. Must be run to the satellite tuner in the back right side of the trunk. I wanted to retain the factory satellite after adding an aftermarket AUX/Bluetooth adapter in my 2007 A4. Enfig was the only company I found with a solution. I had been told by the adapter manufacturer this was not possible, so I was skeptical but decided to try it. The detailed product description was very helpful in selecting the correct Sat Pass for my configuration. I installed the Sat Pass 2 as shown in the Enfig You Tube videos and it worked exactly as advertised on the first try. Thank you Enfig for the detailed description, installation videos, and a great product.